Simply call a plumbing company and ask if the contractor can use a camera to inspect the sewer. Your real estate agent might be able to refer several companies to you. The plumbing company inserts a snake attached to a small video camera into the clean-out and snakes the camera through the sewer. You can watch the image on a monitor. 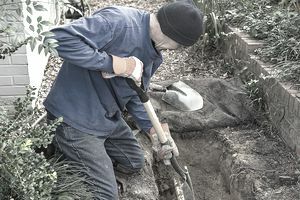 Not only will the plumbing company find out if the sewer line is clean or clogged, but the inspection will disclose the condition of the sewer. Ask the contractor to tell you what kind of material was used to construct the sewer line and whether that type of material is considered good construction today. Some sewer lines are made up of different materials, from Orangeburg to clay to cast iron. Three homes recently inspected produced three separate results. The first home, built in 1930, was located in the Land Park neighborhood of Sacramento. The buyers, expecting the worst, were pleasantly surprised to learn the sewer line was brand new. This was a desirable selling point that the listing agent and the seller neglected to disclose.